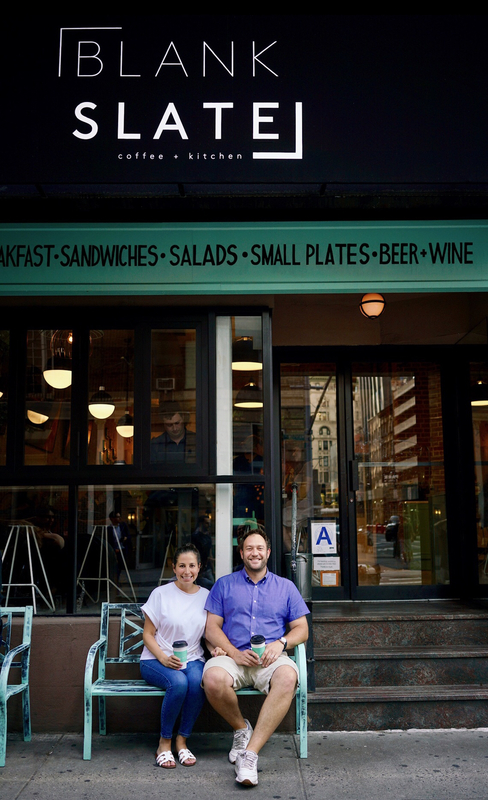 This is Ashley Jaffe and her husband, Zach Israel, the co-founders of Blank Slate Coffee + Kitchen and Blank Slate Tea. Ashley and Zach opened Blank Slate Coffee + Kitchen in November 2015 and took painstaking efforts in the layout, design and menu creation to make the café feel like an extension of the customer’s home or office. They wanted Blank Slate to be a place where guests could come to work, meet friends, relax; be the go-to spot for anything and everything. Hence the name, Blank Slate- a place for growth, creativity and unlimited possibilities, which is truly what this café has created for Ashley and her husband. Unlike most restaurant owners, Ashley didn’t grow up in the food industry and she doesn’t have a culinary background. Ashley worked in Public Relations for 10 years, specifically covering celebrities and entertainment, but fell in love with food and beverage after landing on The Food Network account at her firm. She started doing food and beverage PR, covering restaurants, spirits and soft drinks, and met her husband, Zach, who had an extensive background in the hospitality industry. Both had a love for food and beverage and, at the time, saw a huge gap in the market for a café where you could get an awesome meal and a killer cup of coffee at the same place. After dreaming up this vision for an all-day café concept, where people could “just come in and hang” (a la Central Perk in Friends), Ashley decided to quit her job, become business partners with Zach and open Blank Slate. Although Ashley says she had no idea how to run a restaurant when they started, she is now the key decision maker for the business and runs the day to day operations. She admits that she has run into one or two issues being a female business owner (mainly men asking her if she needs to consult with her husband before making a decision related to the business, which she laughs off as “silly”) but overall she has been extremely lucky with the support she has received, especially from other women, some of whom own their own business or come in specifically because it is a female-run business. For Ashley, it’s the relationships that she’s cultivated that have made the business so rewarding for her and that have also made the business so successful. Ashley takes her time training each and every employee, personally sitting down with each person to explain how and why the business got started and allowing them to understand each part of the business and how it works. For her, it’s very important to take time with the onboarding process and “set each person up for success”. The personal touch is what makes her a unique and valued business owner- five of her staff members have been with her since day 1. Which is impressive in an industry with such high turnover. The solid relationships with her dedicated staff and regular customers allowed her to open Blank Slate Tea this past April, a passion project for her as an avid tea drinker. Ashley designed the space to be fun and girly and Instagram-friendly (which is where she says a huge chunk of her business comes from) as well as an event space, where they can host private events such as baby showers and bridal showers, without having to close down the café, which is just two doors down from the tea shop. Being husband and wife as well as co-business owners is difficult for some people but Ashley says that she and Zach have varying strengths, which is actually an asset for the business. Zach is the “down and dirty operations guy” that can solve a problem without hesitation while her PR/Marketing/social media skills, attention to detail and charisma have allowed her to create a mission-driven business with its own unique personality. Coming from an extensive food and beverage background, Zach is also a great support system for her, since he’s more comfortable dealing with the ups and downs of the industry. He keeps her calm, even during insane periods of stress and anxiety, reminding her to trust the system she’s put in place and to just keep chugging along. In a business that relies on relationships with customers and staff that they seem to have mastered, it’s also the relationship between Ashley and Zach that makes Blank Slate a refreshing dining experience that fits every taste.